I am happy to visit with you again today. A couple of friends have mentioned the movie The Incredible Journey. I have not seen this film, but it sounded interesting, so I looked into it to share with you. 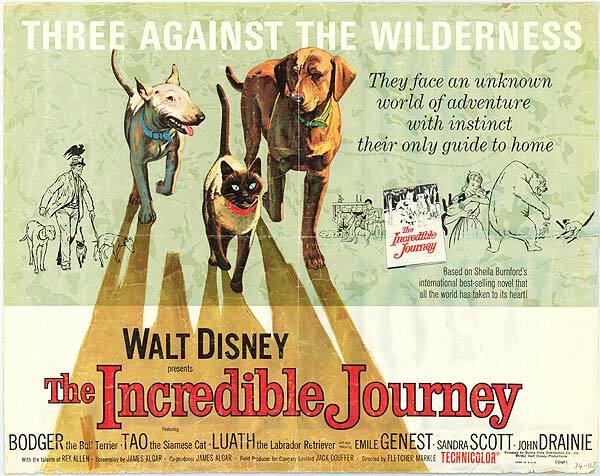 The Incredible Journey was a 1963 live action Disney movie. 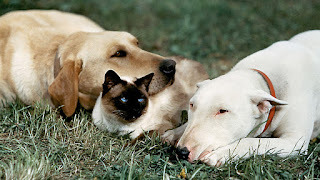 It starred two dogs - a Retriever and a Bull Terrier - and a Siamese cat. They were on vacation with their family and they got lost. The movie is about their journey home. The pets are named Luauth (Labrador Retriever), Bodger (Bull Terrier), and Tao (kitty). The movie is filmed in the Canadian wilderness. Trivia -- the kitty from this movie, Syn Cat, also appeared in the Disney movie That Darn Cat! More Trivia - the movie was later remade as Homeward Bound. More on that in an upcoming blog post! Have you seen this movie or the remake Homeward Bound? I would love to hear from you about this, or any other favorite dog movies, in the comments, below. Oh my goodness I forgot about this movie! I loved it so much when I was little! I LOVE HOMEWARD BOUND! 100% one of my favorite movies growing up. Now I want to watch it! I had no idea that Homeward Bound was a remake!!!! I love it! Now I need to watch the original! 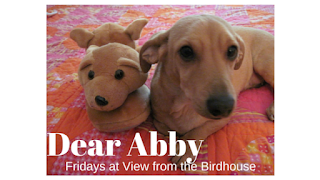 I thought my son and I had watched all the dog movies, but I forgot this one! Will have to watch it with him tonight. I've seen homeward bound but not for so many years. I remember crying watching it, so I haven't seen it again. I had no idea it was a remake! I love dog movies! Haven't watched this one though. Adding this to my list of movies to watch. I love this movie. I watched it as a child. Thank you all! I enjoyed your comments. Oh so lovely movie, this is a family movie and I love when its about dogs, we kinda feel we belong in the journey of the characters. ifillLife - I agree! Well stated. I have seen both movies & because of my fondness for the first or original movie by Disney, simply called “The Incredible Journey,” I never really cared for the remake. “The Incredible Journey” is an awesome movie, in my opinion. I grew up watching the classic Disney movies that were made between the 1930’s to the 1970’s. The movie is narrated. The animals don’t speak. It has the orchestral beautiful Disney background music. The three animals that are the stars are all charming & endearing each in their own way. This movie will not appeal to everyone, but well worth seeing at least once, just in case you fall in love with this classic Disney animal adventure movie, as I have fallen in love with it, since my youth & I still have the movie & continue to be drawn to its endearing style & watch it as an adult. I love your description of the movie -- narration with a beautiful Disney score is such a lovely combination too!